A family, claiming to be from Colombia, is arrested by RCMP officers as they cross the border into Canada from the United States as asylum seekers on April 18, 2018 near Champlain, N.Y. Managing the influx of asylum seekers at unauthorized points along Canada’s border with the United States is on pace to cost Ottawa more than $1-billion over three years, a new analysis from Parliamentary Budget Officer Yves Giroux says. In a report released on Thursday, the PBO estimates the government spending at $340.2-million last year, $367.8-million in the current fiscal year and a projection of $395.9-million in 2019-20. It said the average cost for each migrant who entered Canada between border crossings is $14,321 for the entire refugee claim process. That figure is predicted to rise to $16,666 in the fiscal year that begins April 1, 2019, as wait times in the system get longer. The PBO’s estimates do not attempt to calculate the costs for provinces. 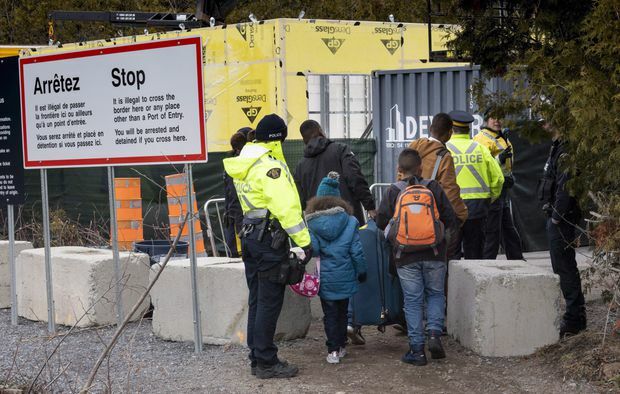 The government of Ontario has said it has incurred $200-million in additional expenses in areas such as housing, social assistance and education that it attributes to the rise in asylum seekers. The city of Toronto has requested financial help to deal with increased demand in its shelter system. The report focuses on extra federal spending for public-service staff and the cost of providing medical and legal services to asylum seekers. For instance, the Interim Federal Health Program provides health insurance for people who are claiming refugee status. The report said that if the federal government decides to provide additional compensation to provinces and municipalities, those transfers would add to the figures released in Thursday’s report. Immigration Minister Ahmed Hussen said the government is trying to reduce costs by speeding up processing times. He also said Ottawa is open to providing more money to provinces and municipalities. In an interview, Mr. Giroux cautioned that estimating future costs is challenging because it is hard to know if the government will be able to reduce backlogs in the appeal process, which is a main cause of the higher costs. Another factor that is hard to predict is the future number of asylum seekers, given that border crossings appear to be driven to some extent by news stories about U.S. immigration policies. “Whatever the U.S. does or doesn’t do will have an impact on the flow of irregular migrants into Canada,” he said. The 2018 budget announced $173.2-million over two years to address irregular migration, which the government defines as movement outside the regulatory norms. The government promised the new money would speed up processing of asylum claims, but the PBO report says average waits will likely get worse, potentially reaching four years between arrival and resolution. Nearly 38,000 asylum seekers have entered Canada between authorized crossings along the U.S. land border – mostly through Quebec – since January, 2017, putting immense pressure on Canada’s refugee system. They are taking advantage of a loophole in a 2004 Canada-U.S. border agreement. The Safe Third Country Agreement requires both countries to refuse entry to asylum seekers who arrive at official border crossings, because Canada and the United States are both considered safe for refugees. However, since the agreement applies only to people who arrive at official points of entry, asylum seekers can avoid being turned away by entering between official crossings. The Conservatives have repeatedly called on the government to close the loophole. The NDP has urged the Liberals to suspend the pact so asylum seekers in the United States can claim refugee status at official Canadian land border posts. The PBO’s cost estimates were produced at the request of Conservative MP Larry Maguire. The party’s MPs said at a news conference on Thursday that they are shocked by the findings, especially because the figures do not include provincial costs such as social welfare and subsidized housing. “It just blows my mind that between 2017 through next fiscal year, this Prime Minister is choosing to spend $1.1-billion on essentially what amounts to the abuse of our asylum system. Some of the numbers in here are absolutely shocking,” Conservative immigration critic Michelle Rempel said.